Noah Picton fires a pass downfield for the Rams. If you want to go to the first football game at the new Mosaic Stadium in Regina, you are going to have to act fast. The first contest at what will be best known as the new home of the CFL’s Saskatchewan Roughriders will be a Canadian Interuniversity Sport football clash between the University of Regina Rams and the University of Saskatchewan Huskies on Oct. 1 at 2 p.m. The battle between these provincial rivals is being dubbed “the SaskTel Fall Classic,” because SaskTel jumped in as a major sponsor. Individual tickets went on sale July 26 and were available through the websites and ticket offices of both the Rams and the Roughriders as well as through Ticketmaster’s site. On Friday, the Roughriders ticketing team sent out an email saying 85 per cent of the tickets for this contest have been sold. As this battle between the Rams and Huskies will be the first test event for new Mosaic Stadium, capacity has been set at 16,500. New Mosaic Stadium will have a standard capacity of 33,000, when it is fully operational. Almost a month ago in this blog, I expressed doubts that this game would sellout. Both the Rams and Huskies have had numerous promotions in the past to get past 10,000 in attendance for a game since the Rams joined the CIS ranks in 1999 but have come up unsuccessful. The fact 85 per cent of the tickets have already been sold means a huge congratulations has to be passed on to those involved. That means just over 14,000 people have tickets for this regular season contest. Since 1999, the biggest crowd for a university level football game in Saskatchewan has been hosted by the Huskies, who crammed 12,567 spectators into Griffiths Stadium for the 2006 Vanier Cup. The host Huskies fell in that national final to the Universite Laval Rouge et Or 13-8. Huskies RB Tyler Chow zips past the Rams defence. The biggest crowd to attend a Canada West Conference regular season football game came back in 2013, when 10,199 spectators turned out to see the University of Alberta Golden Bears take on the University of Manitoba Bisons at Investors Group Field in Winnipeg. The match between the Rams and Huskies at new Mosaic on Oct. 1 has obviously benefited from the marketing arms on a number of fronts including the Rams, Roughriders and SaskTel. Whoever had the original idea of having the Rams square off against the Huskies at new Mosaic has to be considered the biggest visionary in this whole process. For the Rams, this has to been seen as a big coup for them and the University of Regina. The obvious draw for this game is, of course, the chance to get the first look at the province’s new state of the art football facility. The only question left regards how good the competitive level of this contest will be. Fans of both teams might get a glimpse of that fact this coming Friday in Saskatoon, as the Huskies host the Rams at 7 p.m. at Griffiths. With that said, Friday’s clash is the regular season opener for both sides, and opening day games are usually filled with their share of unexpected occurrences. New Mosaic Stadium under construction back in April. Both teams staged a classic to close their respective regular season schedules last year at old Mosaic Stadium. The Huskies trailed 34-11 late in the third quarter before rallying for a 38-37 victory. The Rams finished the 2015 campaign at 0-8 with that loss. The Huskies improved to 3-5 to claim the last playoff berth in Canada West. U of S’s season came to a close with a 37-29 loss in a Canada West semifinal playoff contest in Calgary against the University of Calgary Dinos. Both the Rams and Huskies will be improved. Thanks to a strong recruiting class, the Huskies are probably closer to returning to the form of achieving a 6-2 regular season record. No matter where the Rams and Huskies are in the Canada West standings by Oct. 1, the SaskTel Fall Classic is well on its way to being an overwhelming success. Defensive back Dylan Niedermaier returns an interception for the Colts. The Calgary Colts were ready to take care of business, and they did just that. On Sunday at Saskatoon Minor Football Field, the Colts took a big step to joining the upper echelon of the Canadian Junior Football League downing the defending league champion Saskatoon Hilltops 36-21. The Colts stormed out to a 36-0 lead after three quarters against their biggest nemesis before the venerable Hilltops tried to make a desperate rally in the fourth quarter. Having hired British Columbia Football Conference legend Matthew (Snoop) Blokker as head coach before the start of the 2014 season, the Colts have been on the rise. After going 0-8 in 2013 the season before Blokker came on board, the Colts advanced to the Prairie Football Conference final in each of the last two years posting a 9-7 record in regular season play only to fall to the Hilltops. The storied Hilltops advanced to win the Canadian Bowl after each of those victories. Quarterback Bailey Wasdal (#4) dives in for a Colts touchdown. Coming into this first and only regular season encounter with the Hilltop in the 2016 campaign, the Colts visibly had a different demeanor. When the dust settled, they improved to 3-0 to sit alone in first place in the Prairie Football Conference, while the Hilltops fell to 2-1. “We came in here with a different kind of mentality than we had in previous years,” said Colts starting quarterback Bailey Wasdal. “We came in ready. We weren’t scared. Calgary’s defence set the tone early as defensive back Dylan Niedermaier returned an interception 40 yards deep into Saskatoon territory. That set up a short drive that ended with Wasdal hitting receiver Jake Creasey on a nine-yard scoring toss to put the visitors up 7-0 just over four minutes into the contest. The Colts celebrate a fumble return touchdown by Dallas Burke (#17). Due to bad field position, the Hilltops were forced to concede a safety with 1:59 to play in the first quarter to give Calgary a 9-0 edge. The Colts proceeded to go up 16-0 just as the opening frame expired as Wasdal hit receiver Richard Sindani with a 12-yard scoring toss coming off a swing pass play. Things only got worse for the Toppers in the second quarter, when Colts defensive back Luk Catellier made an interception to set up another Calgary scoring drive. That ensuing offensive series was capped by a one-yard touchdown dive by Wasdal to put the Colts up 23-0. The hole got deeper for the hosts, when the Hilltops proceeded to muff the ensuing kickoff. The ball was recovered by Colts receiver Dallas Burke, who ran the ball home 20 yards for another major score to put the Colts up 30-0 with 6:44 to play in the second quarter. Colts kicker Stephen Fabian booted a 37-yard field goal to give Calgary a 33-0 edge at halftime. “We definitely did a lot of things well, and it is going to show in the film for sure,” said Wasdal. “I think we came out trying to be physical, and I think that is what we did. Dylan Minshull (#21) ran for 169 yards on 22 carries for the Colts. Fabian nailed a 40-yard field goal early in the third quarter to put the Colts up 36-0. The Hilltops attempted a comeback in the fourth quarter. Just 15 seconds into the frame, Hilltops receiver Jason Price outfought a couple of Colts defenders for the ball to pull in a 12-yard scoring toss from quarterback Jared Andreychuk to cut Calgary’s lead to 36-7. Andreychuk proceeded to hit Price on a deep 32-yard connection for another Hilltops major score to trim Calgary’s lead to 36-14 with 8:08 to play in the game. With 2:53 remaining on the clock, running back Logan Fischer muscled in a major on the ground from three yards out to pull the Hilltops to within 36-21. The rally was sniffed out on Saskatoon’s next offensive series, when Andreychuk was intercepted by Colts defensive back Jordan Rae. Andreychuk completed 19-of-34 passes for 227 yards, two touchdowns, but he was intercepted three times. Fischer piled up 110 yards rushing on 23 carries. Jason Price hauls in a 32-yard TD catch for the Hilltops. Wasdal completed 18-of-23 passes for 165 yards, two touchdowns and no interceptions for the Colts. Calgary running back Dylan Minshull piled up 169 yards rushing on 22 carries. The Colts defence forced five takeaways in the contest, while the Hilltops were only able to force one turnover from the opposition. While both teams have six games remaining on their respective regular season schedules, the Colts hold the standings tiebreaker with Sunday’s win over the Hilltops going forward. “It is absolutely huge,” said Wasdal. “We had our own destiny in our own hands. The Hilltops return to action this coming Sunday, when they travel to Edmonton to take on the Wildcats (0-3). The Colts host the Edmonton Huskies (1-2) on Saturday. The Gordie Howe statue in front of the SaskTel Centre. The Saskatoon Blades have mastered the art of the emotional tribute since coming under the ownership of Mike Priestner, and their upcoming regular season home opener might provide the biggest challenge to date in this department. The brain trust of the local WHL franchise is planning a “Thank You, Mr. Hockey” day, when the Blades open their home regular season schedule against the Swift Current Broncos on Sunday, Sept. 25 at 2 p.m. at the SaskTel Centre. Of course, the Blades will be honouring one of the greatest hockey players of all time in the late Gordie Howe. Howe, who was born in a farmhouse in Floral, Sask., and moved to Saskatoon at age 9, passed away earlier this year on June 10 at age 88. It is expected that cremated remains of Gordie and his wife, Colleen, will be interred in front of the SaskTel Centre by the Gordie Howe statue. This will occur if the Government of Saskatchewan approves designating the Gordie Howe statue and a small piece of land around it a cemetery. Colleen Howe passed away on March 6, 2009. Saskatoon city council has begun the process of applying to the province regarding the special designation for the Gordie Howe statue. Currently, the plan for the festivities on Sept. 25 will see the cremated remains of both Gordie and Colleen be interred during a private ceremony at the statue. From there, the Howe family will make their way to the newly built Circle Drive South Bridge, which is being renamed the Gordie Howe Bridge. The day’s events will then shift back to the SaskTel Centre for a special pre-game ceremony. All four of Gordie and Colleen’s children will be in the city for all the day’s activities. At the moment, the pre-game ceremony is slated to be 25 minutes in length. The Blades will also unveil other special initiatives closer to Sept. 25, and some will be kept a surprise until game day. This will be a must attend Blades game. Anytime they have hosted a special pre-game ceremony with an emotional component it has been a hit. Some of the more notable ones include honouring former team member Nelson Nogier when he played is first game back in Saskatoon as a member of the Red Deer Rebels, rallying for La Loche this past January after a shooting occurred in that community and supporting Grade 2 student Naomi Lendvay, who is fighting stage four pediatric cancer. If you have seen the Blades host other pre-game ceremonies in the past, you can expect the one they hold to honour Gordie Howe will be pretty cool and emotional in a good way. The Blades have hinted a couple of former rivals and other special guests will be in attendance. For citizens in Saskatoon and area, this provides a chance to recognize a Canadian icon who really put the city on the map. When you bring up Gordie Howe’s name, there is no shortage of great stories and the ones that have already been told never lose their lustre when they are told again. RB Logan Fischer zips upfield for the Hilltops. The venerable Saskatoon Hilltops showed a bit of a hiccup regarding the after effects of losing 16 players to graduation after last season. On Sunday, the Hilltops traveled to Edmonton to face the Huskies jumping out to a 22-0 lead after the first quarter before the offence dried up for a bit. The defending Canadian Junior Football League champions held a commanding 22-3 at halftime, before the Huskies closed to within 22-20 early in the fourth quarter. Just when things looked in doubt, a couple of steady veterans came through. With 9:59 to play in the fourth quarter, fourth year running back Logan Fischer ran in his third touchdown of the day to put the Hilltops up 29-20. Fifth-year quarterback Jared Andreychuk added a rushing major of his own with under 30 seconds to play in the contest to give the Hilltops a 35-20 victory. Andreychuk completed 20 of 28 passes for 218 yards and one touchdown coming on a trick play throw to defensive lineman Tom Schnitzler. Defensive lineman Blake Hermann had a huge game with six tackles and three sacks in being named the defensive player of the week for the Prairie Football Conference. Normally, the Hilltops usually romp over the Huskies, but an improved Edmonton side was ready for a battle. 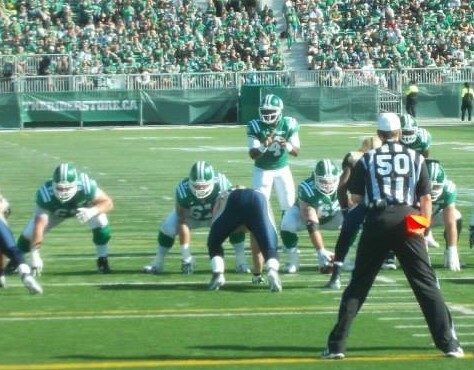 When the dust settled, Saskatoon found a way to improve to 2-0, while the Huskies fell to 0-2. Now the Hilltops head into a showdown for first place in the PFC with the Calgary Colts (2-0) this coming Sunday at 1 p.m. at Saskatoon Minor Football Field. This coming weekend will be a big one for the Hilltops as they celebrate their 70th anniversary. The Toppers will be hold special functions in the days leading up to the game with the Colts, where all the Hilltops alumni in attendance will be introduced at halftime. When the Hilltops hit a rough stretch, you have to love how Tom Sargeant says first the coaching staff, including himself, have to find ways to be better in order to help their players be better. You can bet the Toppers intensity will be up at practice to ensure the team adds a capper to what will be a memorable weekend. QB Mason Nyhus slings a pass for the Huskies. While all eyes are focused on who the University of Saskatchewan Huskies will start at quarterback in the present, their likely signal caller of the future showed the team doesn’t have to worry about depth at that position. On Saturday at Griffiths Stadium, rookie Mason Nyhus, who just graduated from Regina’s Riffel High School, was firing lasers all over the field, when his turn came up to take snaps under centre for the Huskies in a controlled scrimmage against the University of Alberta Golden Bears. The youngster looked fairly composed and showed off some good chemistry with fellow rookie receiver in Ben Getzlaf, who just graduated from Saskatoon’s Holy Cross High School. Nyhus comes to the Huskies as a highly touted prospect. He quarterbacked Saskatchewan’s provincial team to a bronze medal win at the 2015 Football Canada Cup in Saint Jean, Que. At the International Bowl series that ran Jan. 31 to Feb. 1 in Arlington, Texas, Nyhus was calling signals for Canada’s under-18 team. In July, Nyhus was a member of Canada’s Junior National Team that won the International Federation of American Football under-19 World Championship in Harbin, China. With the Huskies, Nyhus won’t be thrown to the fire right away. The training camp battle for the starting quarterback spot is between Drew Burko, who is in his fifth year, and Kyle Siemens, who is in his third year. A year ago, Burko was the incumbent starter for the Huskies, but he lost job as the team struggled. Burko threw nine interceptions in six starts. Siemens finished the year starting the Huskies final two regular season games and their Canada West Conference semifinal playoff loss to the University of Calgary Dinos. The Huskies were 3-5 in regular season play in 2015 after going 6-2 in 2014. The Huskies open the 2016 regular season against the University of Regina Rams on Friday, Sept. 2 at 7 p.m. at Griffiths Stadium. Nyhus will be able to learn the ropes at the Canadian Interuniversity Sport level playing behind Burko and Siemens, which will include learning how to balance school work with athletes. The first day of classes is usually a shocker for first-year students. Under a different set of circumstances, Nyhus might even be able to start as a rookie. With that said, rookie starting quarterbacks usually get beat up at the CIS level. During Saturday’s controlled scrimmage, Nyhus wasn’t going to see all the different looks the Golden Bears defence has or face all of U of A’s starters at once. Nyhus will have the benefit of being able to become a successor in two to three years. If the business major puts in his work getting physically stronger, becoming a student of the game and tackling his studies in the classroom, he will shine one day. If the unthinkable happens that both Burko and Siemens are lost to injury at the same time, Nyhus will likely be a capable fill in. The University of Saskatchewan Huskies men’s hockey is loading with some major WHL talent as they attempt to defend their Canada West title. On Wednesday, the Huskies announced they have added 10 former WHL veterans to their roster. The additions include forwards Alex Forsberg, Connor Gay, Wyatt Johnson, Elliott Peterson, Carson Stadnyk, Colton Stephenson and Jordan Tkatch. On defence, the Huskies added Colby Harmsworth and Tanner Lishchynsky, while goaltender Daniel Wapple rounds out the recruiting class. Before Wednesday’s announcement, a prominent alumnus of the Huskies men’s hockey team told me this class was going to be really good, and he wasn’t kidding. At forward, the Huskies could easily create a new first line from their first-year players. Forsberg’s addition will likely turn out to be a huge one. The brother of Huskies defenceman Jesse Forsberg, Alex’s major junior career started out on a slow pace being shouldered with prodigy status as the first overall selection in the 2010 WHL Bantam Draft by the Prince George Cougars. He was eventually picked up by the Saskatoon Blades for the start of the 2014-15 campaign and regained his confidence recording 13 goals and 20 assists with “the Bridge City Bunch” in 36 games before being dealt to the Victoria Royals. Last season with the Royals, Forsberg finished ninth in league scoring collecting 31 goals, 60 assists and a plus-22 rating in the plus-minus department in 71 regular season games. The Waldheim, Sask., product’s best hockey is likely still ahead of him and not behind him. Gay finished up his WHL career last season leading his hometown Blades in scoring with 25 goals and 47 assists in 70 regular season games. That marked the second straight season he has 20 or more goals in a WHL campaign. Stadnyk will join the Huskies after participating in Edmonton Oilers rookie camp. Last season, Stadnyk, who stands 6-foot-2 and weighs 185 pounds, had 21 goals, 28 assists and a plus-13 rating in 71 regular season games with the Everett Silvertips. Harmsworth was the Hitmen’s overage captain last season, when he collected two goals, 11 assists and a plus-three rating in 67 regular season games. During his four seasons with the Hitmen, the Saskatoon product, who stands 6-foot-2 and weighs 193 pounds, was a steady defensive defenceman. Wapple, who stands 5-foot-11 and weighs 174 pounds, played for both the Regina Pats and Vancouver Giants last season as an overager before finishing up the 2015-16 campaign in junior A with the Estevan Bruins of the Saskatchewan Junior Hockey League. The Saskatoon product’s most memorable WHL season came in 2014-15 when he posted a 29-15-10 record, a 3.03 goals against average and a .906 save percentage in 56 appearances with the Pats. He will provide a solid goaltending partner with starting netminder Jordon Cooke. If Cooke ends up being lost due to injury for a lengthy stretch, Wapple provides a strong insurance policy. With these additions, the ancient Rutherford Rink will likely be rocking, when the Huskies open their regular season against the University of British Columbia Thunderbirds on Oct. 7 at 7 p.m.
Willow Slobodzian has committed to the Fighting Hawks. Saskatoon Stars gifted offensive defender Willow Slobodzian has already found a home for her university career. On Sunday via Twitter, the 16-year-old announced her commitment to join the University of North Dakota Fighting Hawks women’s team. The Clavet, Sask., product still isn’t eligible to play at the university level for another two years. Last season, Slobodzian won the Colleen Sostorics award as the top defender in the Saskatchewan Female Midget AAA Hockey League recording six goals and 13 assists in 28 regular season games. Slobodzian was a key part in helping the Stars win back-to-back league titles in 2015 and 2016, which included advancing to the Esso Cup national championship tournament in both years. The Stars captured a bronze medal in 2015 and finished fourth in 2016. Slobodzian attended the selection camp for Canada’s under-18 women’s team early this month, and she suited up for Canada in a three game series against the United States picking up one assist. The Fighting Hawks definitely landed a gem with Slobodzian’s commitment. Very few players even in the university ranks can equal her smooth skating stride, her accurate blast from the point, her uncanny playmaking ability and her sound play in the defensive zone. If she keeps improving, she definitely has the potential to play at the highest level one day on the international stage. 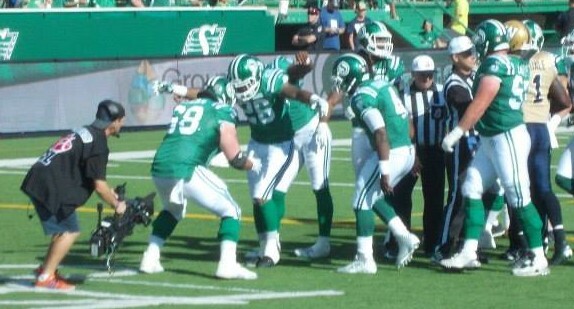 QB Darian Durant calls a play in the huddle for the Roughriders. You have to think some Saskatchewan Roughriders fan somewhere is getting the urge to throw his or her jersey on the field. While I don’t condone that type of behaviour, all you have to do is check social media lines and sports talk shows in Saskatchewan to feel the frustration of Rider Nation. After Saturday’s 53-7 stinker of a loss to the Tiger-Cats in Hamilton, it is getting harder and harder to see the light at the end of the tunnel for the Roughriders, who fall to 1-7 on the season and are 6-29 in their last 35 outings in the regular season and playoffs. A lot of TV viewers undoubtedly switched over from the game telecast on TSN over to see the impressive and heartfelt final performance of the Tragically Hip live from Kingston, Ont., on CBC. The iconic performance of Hip frontman Gord Downie, who is battling terminal brain cancer, will ensure the Roughriders performance will be forgotten for a short moment. The criticism for the “Green and White” won’t stay at bay for long. Outside of a handful of plays against the Tiger-Cats at Tim Hortons Field, the Roughriders weren’t in Saturday’s game at all. The second half really felt like it was mail it in time. You would like to see signs of improvement, but the team just keeps regressing. Right now, the Roughriders are a very brutal CFL football team. There have been a number of things that have been hard to stomach, and a handful of them are as follows. John Chick signs autographs at Roughriders training camp in 2015. In the loss to the Tiger-Cats, Roughriders fans again had to mull over the fact that defensive lineman John Chick was no longer part of the team. Chick was cut by the Roughriders back on Jan. 14. 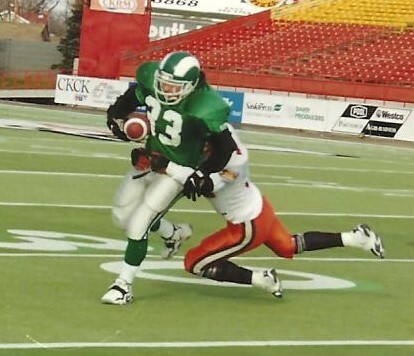 During his time with the Roughriders, Chick became a fan favourite thanks to the combination of his stellar play and the fact he was very active representing the team in the community. The 33-year-old product from Gillette, Wyoming, was with the Roughriders from 2007 to 2009 and was a key cog in the club’s 2007 Grey Cup championship win. After a stint in the NFL with the Indianapolis Colts and Jacksonville Jaguars, Chick rejoined the Roughriders in 2013 and helped them win the Grey Cup later on that year on home turf at Mosaic Stadium. He remained with the Roughriders until being released in January. A day after releasing Chick, the Roughriders signed defensive lineman Shawn Lemon as a free agent. Lemon helped the Calgary Stampeders win the Grey Cup in 2014 and was a key member helping the second year Ottawa Redblacks reach the Grey Cup last year. At age 27, he was also six years younger than Chick, and a lot of people saw Lemon as Chick’s replacement. Lemon played one regular season game with the Roughriders and was traded to the Toronto Argonauts. If you are going to bring in a younger player to replace an established star, you better be sure the younger player stays with your team longer than the established star does, if the star player signs with another team. Chick resurfaced with the Tigers-Cats and has 16 tackles, seven sacks and two forced fumbles in eight games. He recorded two of his sacks on Saturday against the Roughriders. To make matters worse, the Roughriders defensive line has struggled all season especially with getting pressure on the quarterback. 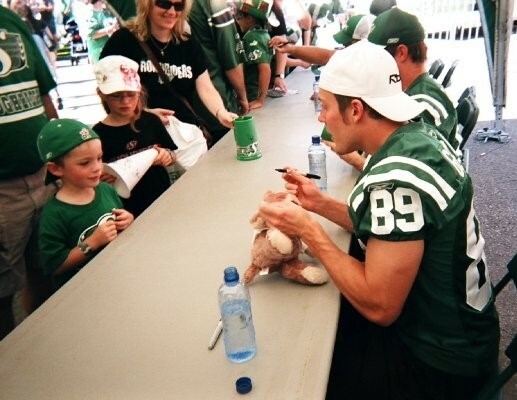 Chris Getzlaf signs an autograph for a young Roughriders fan in 2008. The Roughriders lack of success on the field also has fans missing receivers Weston Dressler and Chris Getzlaf. Dressler was released the same day Chick was and Getzlaf was allowed to become a free agent after last season. Dressler, who turned 31 in July, is currently on the six-game injured list with the Winnipeg Blue Bombers. Getzlaf, 33, signed with the Edmonton Eskimos. The Roughriders have gotten good production from their receivers for most of the season, but there is a feeling among the fans the presence of Dressler and Getzlaf would result in more points. In Dressler’s case, he is also an accomplished kick returner, and if he wasn’t going to be used as a receiver, he is better than any returner the Roughriders currently have on their roster. Both Dressler and Getzlaf played with a lot of heart and genuinely cared about the team and the fans. Without Dressler and Getzlaf, the fans feel less connected to the team. Stamps QB Bo Levi Mitchell escapes the Roughriders rush. On Aug. 11, the CFL fined the Saskatchewan Roughriders $60,000 for roster violations and deducted $26,000 from their 2016 salary cap. The CFL said the Roughriders were in violation of policies that prohibit practice with ineligible players, having players participate in practice who are on the six-game injured list and having free agents practise with players who are under contract. The league’s investigation spanned over several weeks. Since those fines were announced, it seems like everyone has chimed in with their thoughts. The bottom line was the Roughriders were caught violating the rules, and they paid for it. The whole situation also brought out Jones’ weakness on the personnel front. After Jones came on board, it seems players have be coming and going out of the Roughriders dressing room through a revolving door. At some point in time, you need to stick with a group of players and run with them. If you are shuffling guys on and off your roster, you can’t build any chemistry on and off the field that is needed to win. Roughriders fans got their backs up for a short time regarding a Twitter comment Calgary Stampeders quarterback Bo Levi Mitchell made about Saskatchewan’s roster situation a couple of days before the fines were announced. Mitchell’s words didn’t have a lasting impact as the losses mounted. When the Stampeders beat the Roughriders at Mosaic Stadium 19-10 on Aug. 13, the hecklers weren't even that harsh to Mitchell. Members of the Roughriders suspect defence get ready for a play. In too many games this season, it feels like the Roughriders defence is non-existent. Over eight games, the Roughriders have held their opponents to under 30 points twice and under 20 points just once. If you are looking for you offence to score over 40 points a game to win in the CFL, you are in a lot of trouble. Against the Tiger-Cats on Saturday, the Roughriders allowed 421 yards through the air and 88 yards along the ground. You might think the rushing defence would be a strong point, but the CFL has been more of a passing league than normal this season. The Roughriders have been giving up huge amounts of yards through the air all season comparable to the yards given up to the Tiger-Cats. Besides the fact their defensive line has struggled, there are times when the receivers from the opposing team have been wide open to the point you can’t see a Roughriders defensive back anywhere. Jones built a reputation as being an outstanding defensive coordinator in the CFL with the Calgary Stampeders and Toronto Argonauts before becoming a head coach first with the Eskimos and now with the Roughriders. When you become a head coach, it is never a good sign when the side of the ball that is your specialty is not getting the job done. Can the Roughriders break their funk? Roughriders QB Darian Durant stays cool under pressure. While star quarterback Darian Durant had a rough outing against the Tiger-Cats throwing his first four interceptions of the season, he gives the Roughriders a chance to win every time he steps on the field. His composure was evident on Saturday even when things went downhill. Unfortunately, losing has become a habit for this team, and as anyone can see over the Roughriders last 35 games in the regular season and playoffs, losing is a hard habit to break. The Roughriders travel to Edmonton on Friday to take on the defending Grey Cup champion Eskimos (4-4), who appear to be getting on track after two-straight wins. For the moment, it seems like things are going to get worse before they get better. The Hilltops offensive line paved the way for 435 total offensive yards. The Saskatoon Hilltops new look offensive line is no longer a question mark. Coming into the 2016 season, there were concerns the Toppers O-line would no longer be as vaunted as it has been in the past. After winning the Canadian Junior Football League championship for a second straight year in 2015, the Hilltops graduated all-Canadian all-stars in left tackle Terry Thesen and left guard Nathan Heide along with standout centre Jordan Hydomako. Those three departures were more than monster size to say the least. During Sunday’s regular season opening 40-13 romp over the Winnipeg Rifles at Saskatoon Minor Football Field, the Hilltops new look offensive line didn’t skip a beat helping the host side pile up 435 yards of offence including 220 yard along the ground and 215 yards through the air. Tyler Hoath and Drayke Unger were back as starters but in new positions. Hoath moved from right tackle to left tackle, while Unger switched from right guard to left guard. Kirk Simonsen is the new starter at right tackle, Jack Sloboda takes over at right guard and Cord Ivanco handles the duties at centre. Hilltops RB Logan Fischer had lots of running thanks to the O-line's work. They played as a fairly cohesive unit opening big holes for the Hilltops large stable to tailbacks and ensured starting quarterback Jared Andreychuk and backup signal callers Jordan Walls and Tyler Hermann all had comfortable days in the pocket. The Hilltops did not surrender any sacks during their opener. The fact the offensive line jelled so well maybe shouldn’t have been that big of a surprise, and it comes as a testament to the work put in by Hilltops offensive line coach Donnie Davidsen. This year the O-line is also getting additional tutelage from first year coach and former Hilltops player Chris Mercer. Also, Simonsen is in his third year with the team, while Ivanco is in his fourth year. Both worked hard as reserves and they are taking advantage of their time to shine as starters. 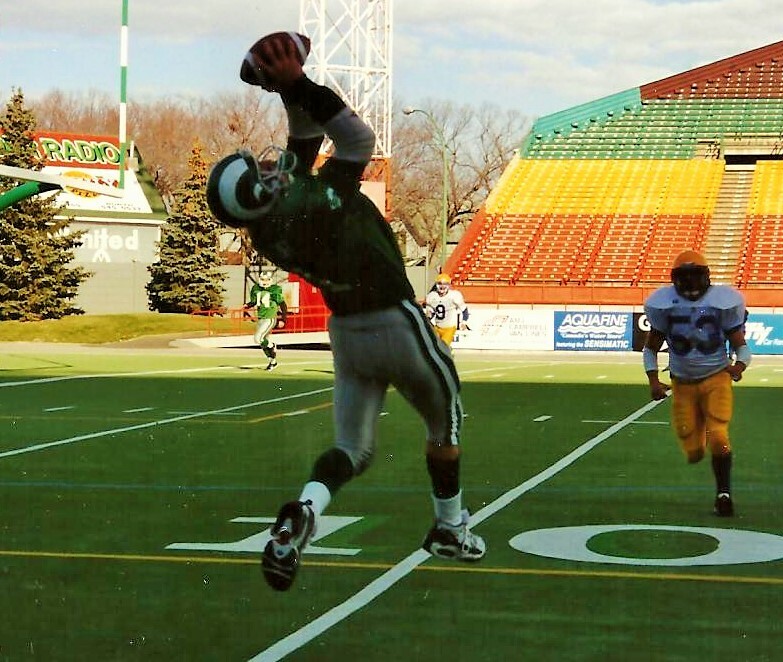 Sloboda moved over to the Hilltops from the University of Saskatchewan Huskies football team, so he also has the experience of being a seasoned post-secondary player. As a unit, the Hilltops O-line was also athletic and mobile, and they allowed offensive coordinator Sheldon Ball utilize a fairly wide open game plan. Hilltops QB Jared Andreychuk was protected well by his O-line. The Rifles played the Hilltops tough as Sunday’s contest was scoreless after the first quarter. Just 45 seconds into the second quarter, Andreychuk hit Ryan Turple with a 67-yard touchdown strike to get the Toppers rolling. Saskatoon went up 14-0, when Andreychuk hit defensive lineman Dylan Buckle with a four-yard toss on a gadget roll out play. Buckle was playing tight end in a jumbo set when he hauled in Andreychuk’s pass. Just a short time after those scores, the Hilltops defence added to the outburst, when linebacker Adam Benkic returned a fumble 22 yards for a major score to put the hosts up 21-0. James Vause proceeded to boot two field goals to put the Hilltops up 27-0 at halftime and the host side cruised on the scoreboard from there. In the second half, Vause hit another field goal, Andreychuk hit third year receiver Sam Mike for a TD strike and rookie receiver Rylan Kleiter booted his first career field goal to round out Saskatoon’s scoring. Rifles quarterback Jamie Ybarra Jr. hit receiver Ian Lee for a six-yard scoring toss and tailback Micheal Ritchott ran in a major from 19 yards out to account for Winnipeg’s points. Hilltops rookie RB Joshua Ewanchyna found lanes to cruise through. Andreychuk completed 8-of-19 passes for 193 yards, three touchdowns and no interceptions for the Hilltops. Logan Fischer rolled off 133 yards rushing on 20 carries for Saskatoon. Ybarra Jr. completed 22 of 35 passes for 262 yards, one touchdown and two interceptions. The Rifles turned the ball over six times, while the Hilltops didn’t have any giveaways. The Hilltops return to action this coming Sunday, when they travel to Edmonton to take on the Huskies (0-1). In Saskatoon’s season opening win, there were bumps which has to be expected at this point in the year. If the Hilltops offensive line can keep rolling, the venerable CJFL club’s quest to win a third straight Canadian Bowl and a sixth league title in seven years becomes much more attainable. Celebrating a Roughriders win over Ottawa with good company in 2014. Like the Saskatchewan Roughriders promotional material from 2013 stated, Taylor Field/Mosaic Stadium is the place where memories are made. I always get a warm feeling when I step into the Roughriders legendary home field. For me, Mosaic Stadium is one of two sports facilities that will always be extremely special for me. The other is The Arena in Medicine Hat thanks to my time covering the Medicine Hat Tigers as a beat writer for 10 seasons. My Mosaic memories don’t just revolve around the Roughriders. During its history, Mosaic Stadium has been the site of countless epic football encounters featuring football teams at the high school, junior and university levels. In recent years, clashes from the Western Women’s Canadian Football League have become part of that history. I have no doubt forgot to mention a tonne of other sporting events and concerts. One big personal regret on the concert front is the fact I missed Bon Jovi’s show in 2010, where Jon Bon Jovi said the Roughriders could use “This is Our House” as their theme song, which the Roughriders did use that season during pre-game intros. There were forgettable memories. No one wants to remember the crap old artificial turf that was used at the stadium in the 1980s and 1990s, which was basically indoor/outdoor carpet laid on top of a cement pad. The carpet would rip and there were times the maintenance crew covered the rip with green spray paint. My list of my top 10 memories at Mosaic Stadium do contain memories of Roughriders football games. The other thing that showed through was my fondness of my time at the University of Regina, as the Rams football team from both the junior and university eras frequent my list quite a bit. Hopefully, I can make people remember a few forgotten classics here. Side note, I wasn’t at the 1995 Prairie Football Conference final that was remembered for Rams quarterback Darryl Leason faking going down to one knee only to throw a touchdown pass to a wide open Josh Shaw. The Rams were supposed to take a knee to conclude a 19-8 victory over the venerable Saskatoon Hilltops, but players in the huddle had other ideas. That moment was remembered in both Regina in Saskatoon for some time. 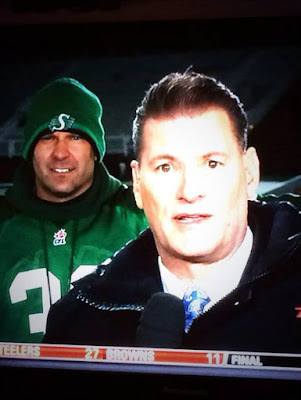 Anyways, here are my top 10 memories of being at Mosaic Stadium or good old Taylor Field. Huskies tailback Tyler Siwak (#19) powers through the Rams defence. The memories of this game will likely warm the hearts of the citizens of Saskatoon. On November 9, 2002, football fans in Saskatchewan got the game they were craving to see. 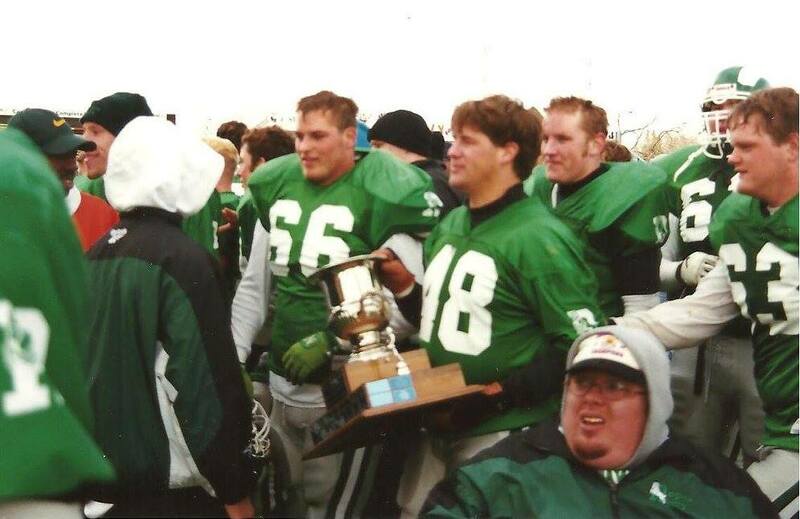 When the Rams left the Canadian Junior Football League after winning their 15th junior national title in 1998 to join the Canadian university ranks, fans in the wheat province eagerly anticipated a Canada West title match between the Rams and the University of Saskatchewan Huskies, who won three Vanier Cups in the 1990s. In the Rams fourth season as a university team, the Canada West title clash happened on a snow covered field at Taylor Field before 5,612 spectators. The Huskies stormed out to a 28-0 lead. The Rams cut the edge to 28-14 and appeared to be driving for another major score right before halftime. Huskies cornerback Ryan Barnstable picked off Rams quarterback Mark Anderson and ran the ball back 92 yards for a U of S touchdown to put the visitors ahead 35-14. The Huskies accept the Hardy Cup in 2002 at Taylor Field. The Huskies closed out a 44-28 victory. U of S power back Tyler Siwak had a legendary performance piling up 160 yards on 21 carries and scoring two touchdowns. Anderson completed 30 of 54 passes for 362 yards, one touchdown pass and three interceptions. When that game concluded, football supporters on both sides figured the Rams and Huskies would clash for the Canada West title on an almost annual basis like the Rams did with the Hilltops in the Prairie Football Conference final in the CJFL. As history has played out to this point, the 2002 encounter is the only time the Rams and Huskies have faced each other in the Canada West final. The Huskies can lay claim they won the most meaningful head-to-head contest between these two teams. Morgan Turner boots a Prairie Conference winning field goal for the Riot. In the short history of the Western Women’s Canadian Football League, old Mosaic Stadium was the site for the circuit’s most memorable playoff clash. On June 28, 2015, the host Regina Riot hit the field against the Saskatoon Valkyries for the fifth straight year in the Prairie Conference final. The Valkyries won each of the previous four clashes and went on to win the WWCFL league title in each of those years as well. The Riot had beaten the Valkyries in Saskatoon 49-9 in the regular season, but questions still remained regarding Regina’s chances against the four-time defending WWCFL champs in the post-season. The Riot were game, and they slowly built a 28-7 edge after kicker Morgan Turner booted a 13-yard field goal early in the fourth quarter. A trademark strong Mosaic Stadium wind was blowing on this day, and it was at the backs of the Valkyries in the fourth quarter. Down 21 points, Saskatoon staged a remarkable comeback. Samantha Matheson powered the Valkyries hopes with four touchdowns. Valkyries running back Samantha Matheson ran in majors from 15, 28 and 25 yards out. The last of those scores came with 1:26 to play in regulation to give Saskatoon a 29-28 lead. The Valkyries held a one-point edge after successfully scoring a two-point convert after Matheson’s first touchdown in the rally. On the day, Matheson piled up 159 yards rushing on 14 carries and scored all four of Saskatoon’s touchdowns. The Riot responded with a final drive into the wind that was powered by running back Carmen Agar and quarterback Aimee Kowalski on the ground. With 15 seconds to play, Turner kicked a 12-yard field goal to give the Riot a 31-29 victory. Regina proceeded to move on to that year’s WWCFL final in Winnipeg and bomb the Edmonton Storm 53-6 for the league title. The Riot’s conference final victory over the Valkyries to get to the league final definitely goes down as an all-time classic between the two provincial rivals. Running back Anthony Allen (#26) celebrates a Roughriders touchdown. I have attended 15 Labour Day Classics in my life between the Winnipeg Blue Bombers and the Saskatchewan Roughriders and the 2014 game made up for the fact I missed the 2007 battle. The 2007 encounter at Mosaic Stadium was of course viewed as the greatest Labour Day battle between these two prairie rivals, as Roughriders quarterback Kerry Joseph ran in the winning touchdown from 27 yards out in the final seconds of the fourth quarter to give Saskatchewan a 31-26 victory. Various other personal commitments that year prevented me from attending the 2007 game. 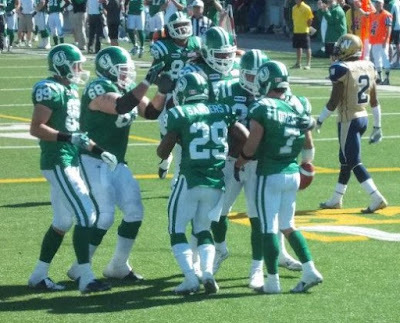 The Roughriders went into the 2014 game as defending Grey Cup champions. They entered the Aug. 31 clash with a 6-2 record, while the Bombers were a healthy 6-3. Saskatchewan took a 21-7 lead midway through the third quarter, but the Blue Bombers rallied and went ahead 27-21 in the fourth quarter. Roughriders quarterback Darian Durant hit wide receiver Taj Smith with a 59-yard touchdown bomb to give the hosts a 28-27 lead with 5:33 remaining in the fourth quarter. Blue Bombers kicker Lirim Hajrullahu booted a 41-yard field goal with 2:58 to play to give Winnipeg a 30-28 edge. Quarterback Darian Durant (#4) calls out signals for the Roughriders. In front of a sellout crowd of 33,427 spectators, Saskatchewan pounded out the game-winning drive on the ground behind running backs Anthony Allen and Jerome Messam along with Durant. With 28 seconds to play, Allen ran in the winning score from 15 yards out to give the Roughriders a 35-30 victory. Allen only had 38 yards rushing in the win, but he scored two key majors. Messam had 64 yards rushing, and the Roughriders combined for 160 yards as a team along the ground in the victory. A Blue Bombers Hail Mary pass on the last play of the game was a no go and allowed the Roughriders to hang on for victory. When the dust settled, those in attendance saw an unforgettable game. Rams head coach Frank McCrystal is ready to hold court in a media scrum. The 2014 Canadian Interuniversity Sport football season marked the last campaign Frank McCrystal would work the sidelines as the legendary head coach of the Regina Rams, and the Rams ensured he had one final home hurrah. On Nov. 1 of that year, the Rams hosted the University of Alberta Golden Bears in a game where the winner would advance to the Canada West playoffs. 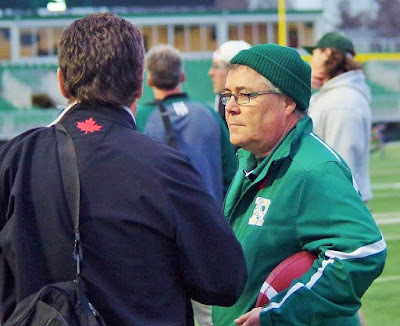 McCrystal was finishing up his 31st season as Rams head coach, which included 15 seasons when the team was still in the Canadian Junior Football League and 16 seasons in the Canadian university ranks. Before becoming head coach, McCrystal spent five seasons with the Rams as an assistant coach and five seasons as a player. The Golden Bears were doing their best to spoil the party, which saw old Rams players from all over the map turn up that day in Regina to see McCrystal’s last game working the sidelines at Mosaic Stadium. The two teams entered the fourth quarter locked in a 21-21 tie. The Golden Bears went ahead 28-21, but the Rams tied things up at 28-28 on 20-yard touchdown run by first-year quarterback Noah Picton. U of A kicker Stephen Fabian booted a 27-yard field goal to give the Golden Bears a 31-28 edge with 7:10 remaining in the fourth quarter. Rams quarterback Noah Picton looks to fire a pass downfield. The Rams took their first lead of the game with 2:40 to play in the fourth quarter, when running back Atlee Simon ran the ball in from 11 yards out to put U of R up 35-31. That score held up as a final, the Rams made the Canada West playoffs and McCrystal won his final home game as Rams head coach. Picton completed 27-of-40 passes for 467 yards, one touchdown and one interception. Golden Bears quarterback Curtis Dell also had a strong game completing 17-of-30 passes for 306 yards. 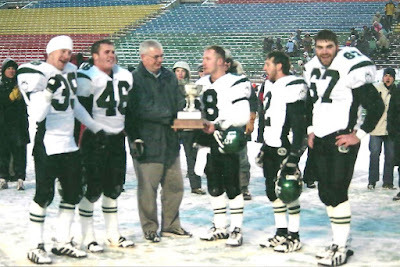 McCrystal received one last ice bucket shower from his players and held court one last time on the Mosaic Stadium turf with the media before making his last departure down the stadium tunnel. His home send-off was a good one. Rams linebacker Jeff Zimmer nails Huskies tailback Tyler Siwak. 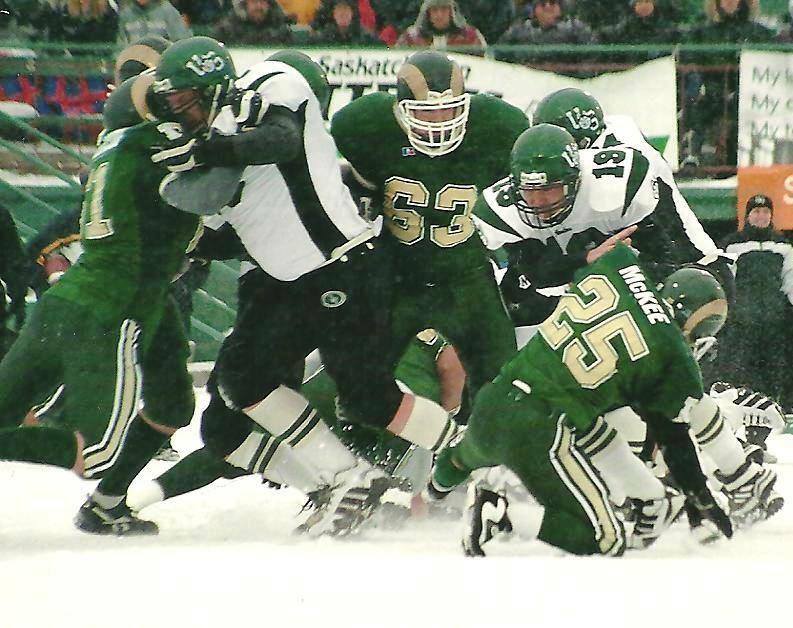 In their early years in the Canadian university ranks, the University of Regina Rams rivalry with the University of Saskatchewan Huskies was at a fever pitch, but their first encounter of the 2001 season had a whole range of different emotions. On Sept. 15 of that year, the Rams and Huskies took to the turf at Taylor Field for the Hall of Fame game just four days after the terrorist attacks in New York City, which saw the fall of the World Trade Center towers after hijacked airplanes crashed into them. It was safe to say everyone who saw the images of what happened in New York City on Sept. 11, 2001 was affected emotionally by them. In May of that year, I had moved away from Regina to work as the sports writer in Prince Albert at the Daily Herald almost a year after graduating from the University of Regina. I had covered the University of Regina’s athletic teams from 1996 to 2001, and most of my old friends from those days were still at the U of R, when I returned from the Hall of Fame game. After the terrorist attacks happened, all I wanted to do was go to Regina and see all my old friends again and be around something that felt normal. It seemed a lot of other people wanted to be around something that felt normal that day as 7,238 spectators attended this clash between the Rams and Huskies. The cheers during the player pre-game introductions for that contest had a distinctly different feel to them. It felt like everyone was happy to be out at a football game. Rams tailback Neal Hughes (#36) burned the Huskies for 221 offensive yards. The Rams three key stars in quarterback Darryl Leason, slotback Jason Clermont and running back Neal Hughes put on a show, and the Rams came away with a 31-21 victory. One of the game’s signature moments came when six Huskies defensive players were unsuccessfully trying to bring Clermont down, and one of those defensive players came at Clermont with a high flying tackle attempt grabbing the receiver around his neck. Clermont still didn’t go down, but the play was blown dead as his forward progress was stopped. Hughes was the night’s MVP. He ran the ball 17 times for 141 yards and scored two rushing touchdowns, and he caught six passes for 80 yards and one receiving major score. It seemed that most members from every other U of R sports team was there that night. After the Rams received the Hall of Fame trophy, everyone from the U of R side slipped off to their favourite long time night spot in Checkers for a joyful and spectacular post-game victory party. Quarterback Jared Andreychuk (#5) led the Hilltops to a big comeback. 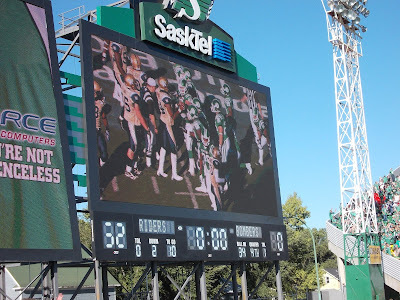 On Sept. 12, 2015, the venerable Saskatoon Hilltops and the Regina Thunder added a chapter to their relatively young rivalry with a classic at Mosaic Stadium. This battle featured everything including strong play from the offences and defences on both sides. The Thunder took a 25-10 lead into the fourth quarter, before the Hilltops rallied. Just 1:38 into the final frame, Hilltops quarterback Jared Andreychuk connected with receiver Davis Mitchell on a seven-yard scoring toss to cut the Thunder lead to 25-17. With 5:26 to play, the Thunder had to concede a safety after being pinned in their own end, which trimmed their edge to 25-19. Linebacker Cole Benkic makes a game-saving interception for the Hilltops. That set the stage for Andreychuk to lead the Hilltops on a two-minute drill type drive 75 yards down the field. The march concluded when Andreychuk hit slotback Evan Turkington on a 13-yard scoring strike. Turkington made a twisting circus catch in the Regina end zone to give the Toppers a 26-25 lead with 75 seconds to play. Saskatoon would cement that 26-25 score as the game’s final, when Hilltops star linebacker Cole Benkic intercepted Thunder quarterback Jaeden Marwick on the ensuing Regina series. Andreychuk completed 21-of-40 passes for 336 yards, three touchdowns and three interceptions for the Hilltops. Marwick connected on 24-of-41 passes for 420 yards, two touchdowns and two interceptions calling signals for the Thunder. When the clock in this one ticked to zero, people from both sides of the rivalry admitted they just saw one heck of game. The Roughriders celebrate a touchdown by Weston Dressler (#7). 52-0. Nothing more needs to be said. If you are a fan of the Saskatchewan Roughriders, you will always remember the day they smashed and absolutely embarrassed the Winnipeg Blue Bombers 52-0 in the Labour Day Classic at Mosaic Stadium on Sept. 2, 2012. When it comes to watching the Roughriders, it seems nothing comes easy for them even during good seasons, which includes games that they dominate. Even in dominant outings, the “Green and White” usually encounters some sort of adversity. 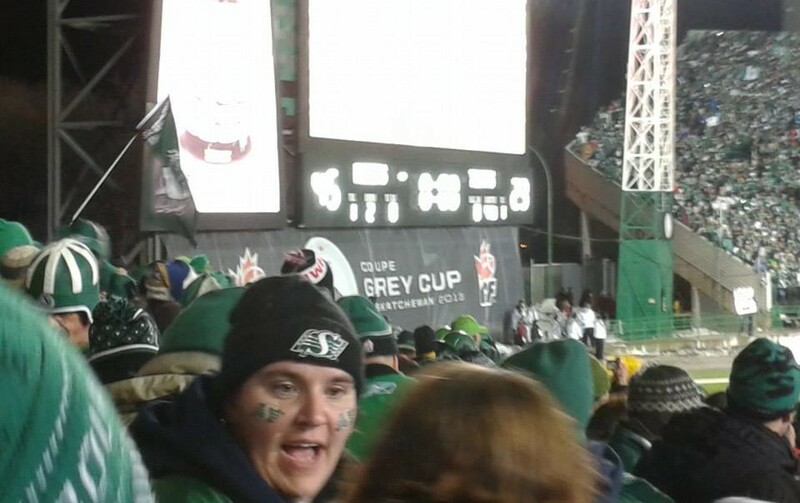 Being at Mosaic Stadium on this day as part of the “Rider Nation” crowd was an absolute blast. It seemed everything that Roughriders did worked. Even when Roughriders star quarterback Darian Durant left the contest due to injury early in the third quarter with his team up 28-0, they still rolled with backup Drew Willy calling the signals. Willy was actually pulled late in the fourth quarter to allow third stringer J.T. O’Sullivan to enter the contest in a relief effort. Roughriders rookie running back Kory Sheets carried the ball 19 times for 109 yards marking the first time he surpassed 100-yards rushing in a game during his CFL career. Star slotback Weston Dressler had a pair of touchdown catches. Willy ran for a major score and hooked up with receiver Terence Jeffers-Harris on a 43-yard touchdown strike. The scoreboard was a site of beauty for the Roughriders. Safety Tyron Brackenridge made the two most memorable plays for the home side in the romp. In the game’s second quarter, he blocked a punt and returned it 15 yards for major, and in the fourth quarter, he returned an interception 39 yards for a touchdown. On the other side of things, the Bombers had an absolutely horrible effort on this day. They gained 102 yards of total offence, and it seemed like they just couldn’t do anything right. A healthy contingent of fans makes their way from Winnipeg to Regina following the Bombers down for the Labour Day Classic, and by the end of this game, I really did feel sorry for anyone that came out to watch the “Blue and Gold” play. Slotback Jason Clermont goes up to make a catch for the Rams. Looking back for those that were there, the final CJFL battle between the Regina Rams and Saskatoon Hilltops might be remembered for being more surreal than for what actually happened in the game. It might be hard for a younger generation in Saskatchewan to fathom, but one of Canada’s greatest historic rivalries in sports was between the Rams and the venerable Hilltops. The Hilltops were born in 1947, won their first CJFL championship in 1953 and have been junior football powerhouse since that time. The Rams were born in 1954, won their first CJFL title in 1966 and built a storied history in the Canadian junior ranks before joining the Canadian university ranks in 1999. After the Rams won their first CJFL championship, it seemed like they were always on a collision course with the Hilltops, where the winner of the eventual playoff game between the two sides often moved on to capture a national title. On October 31, 1998, the Rams and Hilltops met for the final time in that year’s Prairie Football Conference championship game at Taylor Field. 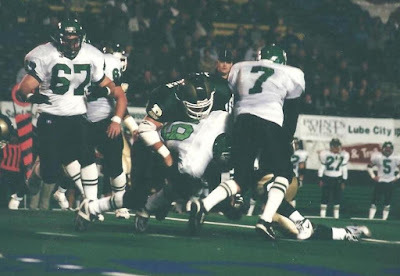 The Rams were the defending CJFL champions and had also won three straight national titles from 1993 to 1995. The Hilltops interrupted the Rams run with a CJFL championship win in 1996, and they also had a national title win in 1991. The Rams take home the PFC championship trophy for the final time. With the history these two squads had with each other, it seemed strange in the hours leading up to the clash to think that this would be the last head-to-head match between these teams. In another strange twist, only about 3,000 people came out to watch this contest, which showed interest had dried up due to the fact important clashes between the two sides became too commonplace. When the game itself was on, all the focus was upon football. The Rams jumped out to a 16-0 lead by halftime thanks to an electrifying 87-yard punt return touchdown by rookie tailback Neal Hughes. Saskatoon battled back to cut the Regina lead to 16-10 by the end of the third quarter, but there would be no rally for the visitors. Regina hit another gear in the fourth quarter piling up 32-unanswered points rolling to a 48-10 victory. Slotback Jason Clermont and fullback Chris Briltz both had rushing touchdowns. Linebacker Cory Thacheray returned an interception 55 yards for another major score. Linebacker Doug Hill blocked a punt and defensive back Corrie McKee recovered the ball and scored the Rams final touchdown of the contest. At game’s end, the Rams celebrated victory, but a strange feeling was also present knowing these two teams would never face each other again in a game. Rams fullback Chris Briltz powers his way past a Sun tackler. 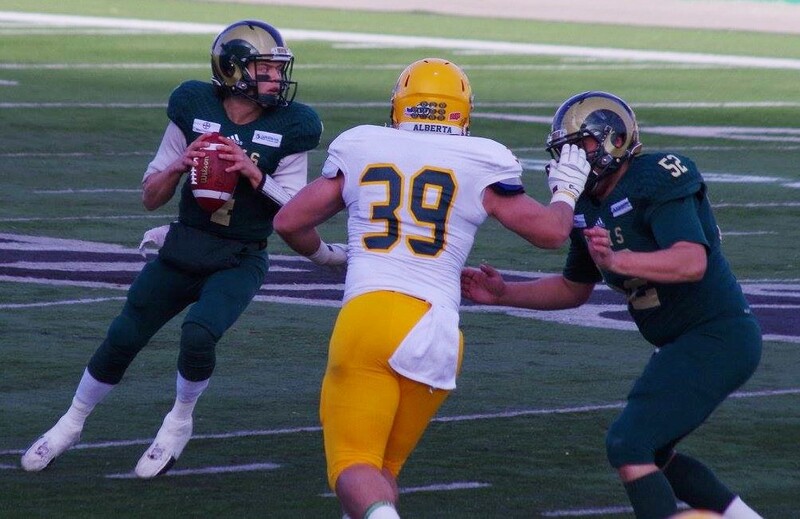 Before departing for the Canadian university ranks, the Regina Rams wanted to ensure they closed out their 45-year history in the CJFL the right way, and they accomplished that in dominating fashion. On November 14, 1998 at Taylor Field, the Rams claimed a 15th national championship bombing the Kelowna, B.C., based Okanagan Sun 36-13. 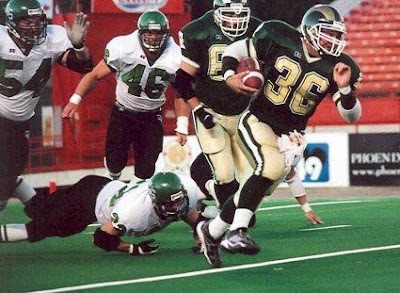 A year earlier, the Rams needed double overtime to beat the Sun 23-20 in Kelowna, B.C., to win the CJFL title and capture the Canadian Bowl, but there was no dramatic finish in 1998. The Rams came out flying from the start. They scored a rouge on the game’s opening kickoff from kicker Todd Pinkney. 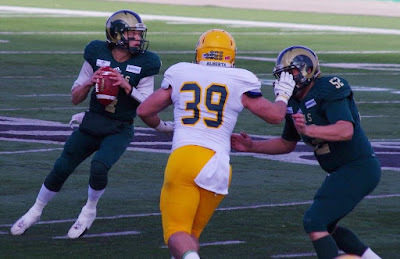 A short time later, Rams linebacker Cory Thackeray blocked a punt and teammate Jeff Zimmer, who was that year’s CJFL defensive player of the year, recovered the ball in the end zone for a touchdown. Before the first quarter ended, Rams running back Cory Olynick romped in for another major score from three yards out to put the hosts up 15-0, and the route was on before a crowd of about 4,100 spectators. 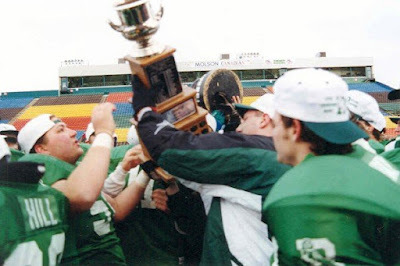 The Rams raise the Canadian Bowl one last time in 1998. Rams Slotback Jason Clermont piled up 124 yards receiving on eight catches and hauled in major scores from 24 and 17 yards out. Rams quarterback Mike Wong completed 19 of 26 passes for 269 yards, two touchdown passes and no interceptions. For one last time when the clock expired, the Rams stormed on to the field to collect the Canadian Bowl. Besides winning their 15th CJFL title, they also claimed their fifth national title over a six year time span. The victory celebration lasted well into the night. Before, during and after the game, it felt everyone that was part of the Rams was focused on just enjoying that game and moment. No one at the time really dwelled on the fact the Rams were playing in their final game as a Canadian junior football team. It wasn’t really until the next day rolled around that thoughts drifted towards the fact the Rams were moving to join Canadian Interuniversity Sport’s football league in 1999. On the day the Rams captured their final CJFL title, the focus of being in and enjoying that moment dominated everything. “Rider Nation” celebrates a Grey Cup victory in 2013. What else would be the top moment at Taylor Field/Mosaic Stadium? If you were there on Nov. 24, 2013 when the Saskatchewan Roughriders captured the 101st Grey Cup with a 45-23 romp of the Hamilton Tiger-Cats, you know that was the best day to be at that legendary facility. The Roughriders win marked the fourth time in team history they captured the Grey Cup, and it would be the only time they would win the Grey Cup at their legendary home stadium. The signature moment came early in the first quarter, when Roughriders franchise quarterback Darian Durant scrambled up field, got hit and fumbled the ball high into the air to be pulled down by running back Kory Sheets. Sheets rumbled off a magical 39-yard game for the home side. As a Roughriders fan, you had a big gut feeling that this game was going to go your way after seeing that play. That drive eventually resulted in a diving 15-yard touchdown reception by receiver Geroy Simon that put the Roughriders up 7-3. Saskatchewan scored 24 points in the second quarter to take a 31-6 lead into halftime. The outburst included another beauty 42-yard touchdown catch by Simon. Hamilton scored the first 10 points of the second half to create a little worry for the Roughriders fans cutting Saskatchewan’s lead to 31-16, but that was as close as the visitors got. I made an appearance on TSN’s post-game coverage. A four-yard touchdown run by Sheets and a 26-yard touchdown reception by receiver Weston Dressler put the Roughriders up 45-16, and the victory celebration in Saskatchewan started in earnest. Sheets had two major scores along the ground and piled up a Grey Cup record 197 yards rushing on 20 carries to be named the game’s MVP. He ran with power and authority. Durant completed 17-of-24 passes for 245 yards, three touchdowns and no interceptions. Slotback Chris Getzlaff was the contest’s most outstanding Canadian player hauling in three passes for 78 yards. The game was also highlighted by two big sacks from Roughriders defensive lineman John Chick. When the clock ticked to zero, people were hugging their neighbours all around them. The image of Durant hoisting the Grey Cup with a huge smile on his face will also live forever. The green and white confetti raining down on the Roughriders players was also a site to behold. For the longest time after that game ended, I remember just sitting in the stands and soaking everything in. Late CFL icon Cal Murphy. 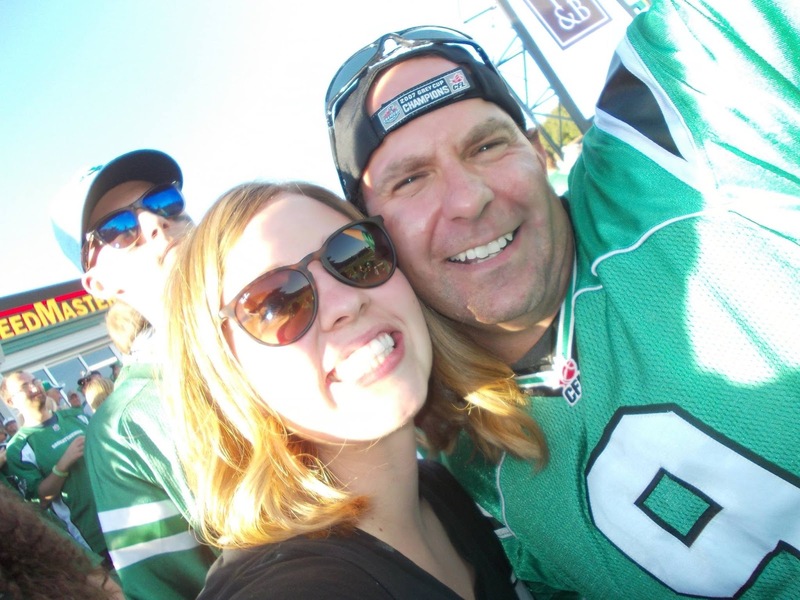 To close off my top ten memories list at old Taylor Field/Mosaic Stadium, I figured I would throw in a bonus moment that was important to me, but something no one else could see. On Aug. 31, 2008, I covered that year’s Labour Day Classic between the Saskatchewan Roughriders and Winnipeg Blue Bombers for the Medicine Hat News. I walked into the press box on the West side and noticed the Roughriders hadn’t assigned me a seat for the game. I wasn’t too worried, and it wasn’t going to be a big deal to stand and watch the game. Long-time CFL icon coach and general manager Cal Murphy, who is best remember for his time at the helm of the Blue Bombers, entered the press box to scout the contest for the NFL’s Indianapolis Colts. Murphy and I had been friends for a number of years at that point, so we hung out and had such an enjoyable 15-minute talk before the game started. After Murphy passed away at age 79 on Feb. 18, 2012, I appreciated visits like that with him that much more. Near the end of the talk, Murphy asked if I had anywhere to sit. I said I didn’t. Murphy said not to worry about that, because I could have his seat. He was going to go down and watch the game with a friend, who was sitting a couple of boxes over. Of course, I thanked Murphy. I was also really humbled. Growing up, I looked up to Murphy, and when I got to know him, he was as good of a man as I thought he would be. To this day, Murphy is the classiest person I have ever met in sports. The Roughriders took that year’s contest 19-6, but I felt like an even bigger winner in the press box. Even until this day, I am floored that Murphy let me have his seat. That small gesture made me feel really special.